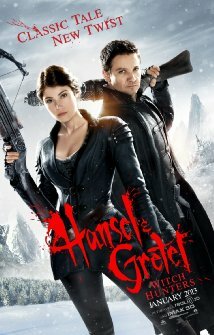 Hansel and Gretel is an action adventure comedy directed by Tommy Wirkola and starring Jeremy Renner (The Hurt Locker, Avengers Assemble) and Gemma Aterton (Clash of the Titans). The plot is based on The Brothers Grimm tale of Hansel and Gretel with a twist. Young Hansel and Gretel get left in the woods by their father and stumble across a cottage made of sweets. Inside is one evil looking witch who tries to kill the siblings but is defeated when they push her in the fire. They then dedicate their lives to tracking and killing witches. To put it simply, this film rocks!!!!! First and foremost I must give kudos to the 3D. Numerous times during the movie I found myself covering my face as pieces of wood, guns and knives came flying out of the screen. Easily the best 3D I have seen in the last 12 months. From the start this movie is full of action. Wirkola did not hold back on the gore with exploding bodies, projectile vomiting and some other horrific death scenes. Two of the witches in the movie reminded me of veiny Willow in Buffy the Vampire Slayer when she turned evil. Lots of witty one liners brought a lighter side to the movie which remained violent throughout. My only negative point would be that I would not have cast Jeremy Renner for the part of Hansel. He seemed quite flat throughout the movie and I think someone like Jenson Ackles (Dean Winchester, Supernatural) would have made Hansel a much more exciting character. The special FX were also great. Famke Jannsen’s transformation into the evil sorcerress Muriel was impressive. This was a movie I was not sure I would like and I ended up loving it. A sequel is obviously on the cards.